As İlkyaz, we work to introduce three young writers every month We translate these works, which are be made up of a short stories or poems, into English and endeavour to introduce them to readers outside of Turkey. January’s works are now live and can be found below. We also aim for a PEN Centre located in a different country around the world to translate the selected writers into their local language and share their works. We are very grateful to PEN Germany who will be promoting our writer’s pieces for the coming month of January. However, German translations were delayed due to an health issue experienced by our translator and will be published as soon as possible. If you haven’t yet had a chance to read, you can reach December’s works here. January’s works by our writers are available via the links below. Don’t forget to check out our writers under the age of 15, Berkay Bayam and Hakan Yeğiner in “15-“, the stories of Fisun Yeşilçimen and Onat Kibaroğlu in “Human Portraits”, and Nina George’s reading suggestions to young writers. 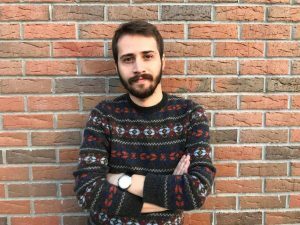 About the author: Deniz Poyraz was born in Lüleburgaz in 1991. He sutudied Art History at Mimar Sinan Fine Arts University. He is currently doing his masters degree in Marmara University publishing management under the Communications faculty. His short story book Eminenin Yanında Konuşulmayacak Şeyler was published by İletişim Yayınları in 2018. His critiques, essays and interviews about literature and fine arts have been published in multiple magazines, internet platforms and newspapers. He lives in İstanbul. If a shirt is ripped and we notice this rupture, then we must mend instead of change it. Whereas the most common mistake we make as humanity is no other than to change our shirts and buy another that’s also torn. Yes, it’s even been the case that we wear ones ripped from the same spot. Not a centimeter above, or below it. Why does mankind do this? Because he allows his arrogance to not stop him. He allows it to discard the ruptured shirt and wear another just like it. You see, at this point the person should pick out all the forks stabbed under his jaw one by one, to learn he’s not the bee’s knees. 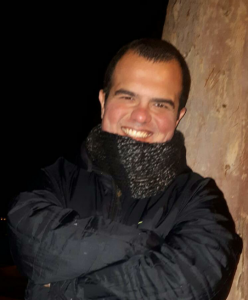 About the author: Farabi Orhan was born in Aydın in 1993. He was raised in İzmir. His grandmother stuck between the names Plato and Farabi preferred Farabi. Although he was studied in German Studies and Archeology he never completed his education. He earned his living by taxi driving, watering, conducting polls and sales representation. He’s been keeping a diary since 8 years of age and has kept an interest in literature for many long years. Toppled home at forty anxious leaps with temerity against myself. In this world, never with its remedy, time and again with its toil I fall into reverie. About the author: Eşref Yener was born in 1992 in Aydın. He graduated from Kocaeli University International Politics Department. He was the president of ÇYDD Contemporary Youth İzmit division in 2013/14. His poems and writings were published in magasines and fanzines such as Varlık, Natama, Sözcükler, Hürriyet Gösteri, Yasakmeyve, Hayal and Marşandiz. 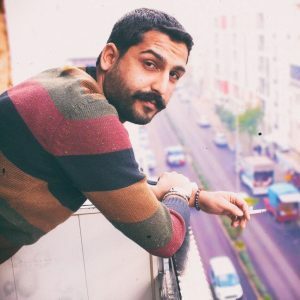 He was the editor of Hayâl publications and magazine between 2016-2018.